I will only add a few remarks to the detailed description given in 1.c. (Jørgensen 1900, p. 52). This species differs from the following [Hexacontium pachydermum] in having a delicate outer shell with comparatively narrow walls between the pores and no byspines. As in the following species [H. pachydermum], the pores on the outer shell are different in size, from 6-10µ, most of them being 8µ, although they are not strikingly unlike. The pores of the middle shell in both species are also alike, there is a slightly variation in the size of them on the same shell, they average 4-5µ (seldom as little as 3 or as much as 7). The pores on the two outer shells area bout equal in number on the radius. But the innermost shell differs considerably in this respect, the pores here being comparatively much larger and consequently much fewer in number. 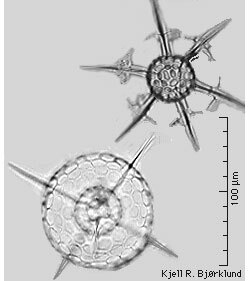 On young specimens, where only the two inner shells are developed, one may often see transverse processus on the radial spines where the outer shell is found later on, these processus forming the intermediate walls of those pores in the outer shell which are situated nearest to the main spines. On still younger specimens, however, these processus are also wanting. Such forms (cfr. Jørgensen 1905, pl. 8, fig. 32) may easily be mistaken for species of genus Hexalonche. If one considers the coincidence in dimensions and constructions of the inner shells of Hexacontium enthacanthum and H. pachydermum, it would, however, seem most reasonable to look upon them as being forms of these species. The outer shell varies in its development from very thin to moderately thick. The pores on the thicker shells seem to be rounder and to have wider walls, which are more plainly widened out in the corners. I have very rarely seen specimens with a trace of byspines (conically heightened parts) in the corners between the pores. These traces of byspines appear, however, to denote that the limit in the direction of H. pachydermum is not certain. The common name ought in this case to be H. pachydermum, which would then represent the grown form. The number of the main spines is usually 6, and sometimes 7, but very seldom more. These are usually about equal in breadth inside as well as outside the outer ball. Ocean forms, of which I have seen few, seem to diverge somewhat (both in this and the following species). The specimen illustrated pl. 8, fig. 30 [Jørgensen 1905] for instance, had a rather strong outer shell with main spines, which, as is the case with H. pachydermum, where considerably narrower inside the shell than outside. The inmost shell too was more solid than usual, and had comparatively more pores with stronger walls (cfr. fig. 30b). The dimensions of the outer and middle shells on 7 individuals (the 6 from the west coast of Norway): Thus it will be seen that the diameter of the middle shell varies remarkably little, while that of the outer varies considerably. Rare, in deep water samples, always in small numbers. Temperate oceanic form, which with us is only found in deep water, especially at a depth of 300m or more. Somewhat more frequent on the west coast of Norway. Also known from scattered spots in the sea beyond the coast of Norway and from the Faeroe and Shetland Isles northwards. Hexacontium enthacanthum JØRGENSEN 1905, pag. 115, pl. VIII, Fig. 30 SCHRÖDER 1909, pag. XVII 10, Fig. 3a d.
Description: This species is characterized by its fairly delicate and thin third cortical shell, with regular to irregular rounded pores. There are only seldom needle shaped byspines on the third shell, when present they are not as numerous nor as well developed as in the other species of this genus. However, this species may easily be confused with juvenile stages and/or not heavily silicified forms of H. pachydermum. According to Jørgensen (1905) the diameter of the third shell ranges from 62 to 90µm (based on four specimens), while the diameter of the middle shell varies remarkably little. Remarks: The similarity of this species with H. pachydermum was also discussed by Jorgensen (1905) who, based on the observation of different growth stages, stated: "These species, which I at first thought very different, agree so remarkably in some respects, that now I consider it by no means unlikely that H. enthacanthum is a young state of H. pachydermum". Description: This species is characterized by its fairly delicate and thin third cortical shell, with regular to irregular rounded pores. There are seldom needle shaped byspines on the third shell, and when present they are not as numerous nor as well developed as in the other species of this genus. However, this species may easily be confused with juvenile stages and/or not heavily silicified forms of H. pachydermum. The diameter of the third shell ranges from 62 to 90pm, while the diameter of the middle shell varies little. Remarks: This form does not differ from H. enthacanthum except for the presence of 7 8 radial three bladed spines.